YEREVAN (RFE/RL)—Official Yerevan said on Monday that it is not worried about Russian Foreign Minister Sergey Lavrov’s remark that Turkey can play a “positive role” in the Nagorno-Karabakh peace process. The Armenian Foreign Ministry said Russia still believes that the normalization of Turkish-Armenian relations should not be contingent on a resolution of the Karabakh conflict sought by Azerbaijan. Visiting Yerevan on Friday, Lavrov said Moscow continues to stand for an unconditional implementation of the 2009 Turkish-Armenian normalization agreements. “But we have a sense that progress in the Nagorno-Karabakh settlement will be key to the normalization of Armenian-Turkish relations,” the TASS news agency quoted him as telling Russian reporters. Deputy Foreign Minister Shavarsh Kocharian also seemed unfazed by those remarks. “Given its overtly once-sided position, Turkey has no place in and must be kept away from the Nagorno-Karabakh negotiation process,” Kocharian told News.am over the weekend. “The only positive impact which Ankara could have on the conflict’s resolution is to open its border with Armenia and stop encouraging Azerbaijan’s provocative and unconstructive actions,” he said. Lavrov was among foreign dignitaries who attended the signing of the 2009 Turkish-Armenian protocols in Zurich. The Turkish government subsequently made parliamentary ratification of those protocols conditional on decisive progress in Armenian-Azerbaijani peace talks. 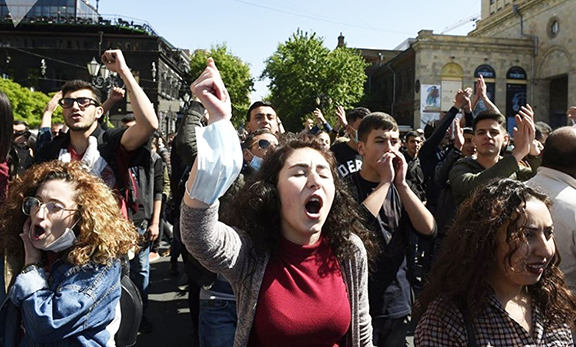 Yerevan rejects this precondition. “Turkey has no place in and should be kept away from the Nagorno-Karabakh negotiation process,” Kocharyan said on Sunday according to the Armenian Foreign Ministry’s press service. “The only positive impact Ankara could have on the Nagorno-Karabakh settlement is the opening of the border with Armenia and ceasing of encouraging Azerbaijan’s provocative and destructive steps,” Kocharyan said. “The statement on the settlement of Nagorno-Karabakh issue, adopted by the Presidents of the CSTO member-countries in Yerevan on October 14, expresses its support to the agreements reached in Vienna and St. Petersburg aimed at the prevention of escalation of situation in the conflict zone, stabilization of situation and creation of conditions for the advancement of peace process. The exclusively peaceful settlement should be based on the three well-known principles of International Law – non use of force or threat of force, the territorial integrity of states and the equal rights and self-determination of peoples,” Kocharyan added. “The position of the Russian Federation on the settlement of Nagorno-Karabakh conflict is expressed by the abovementioned statement, not through the distortion of Sergey Lavrov’s words by the Foreign Ministry of Turkey as presented in the Azerbaijani media: a qualification, which previously was ascribed to the Azerbaijani side for its misrepresentation of the Nagorno-Karabakh negotiation process,” he stated. The only positive impact which Ankara could have on the conflict’s resolution is stop encouraging Azerbaijan’s provocative and unconstructive actions,” ….. Lavrov and Putin are going to be backstabbed by Erdogan all over again.